Whether your company needs a new website to engage with customers, an enterprise-class web app to automate processes, or a web portal to help align your employees' workflows, Chetu's custom web developers have the programming expertise and the industry-specific experience to build it quickly, efficiently and in perfect alignment with your vision. We design responsive and adaptive Progressive Web Apps (PWA), or hybrid apps, that combine the responsive, native feel of an iOS or Android mobile app with the scalability and interoperability of a web app. PWAs include features like push notifications, easy social sharing and superior Indexability. Our industry software experts have years of experience building business automation web solutions for a number of verticals. We use custom APIs and our mastery of web services to build web-based automation services for applications like inventory control, digital marketing and customer relationship management. We build attractive commercial websites that are created with ease of use, SEO, mobile-first responsiveness, conversion optimization, advanced search capabilities, load speed and a modern design aesthetic in mind. We have plenty of experience working with website builders and CMS’s, like Wordpress, Joomla and Drupal. Our web developers program public-facing portals as well as enterprise intranet dashboards that incorporate email and internal messaging, forums, search engines, workflow and task managers, news tickers and multimedia hosting. For private portals we integrate protocols like Role-Based Access Controls (RBAC) and Single Sign-On (SSO). 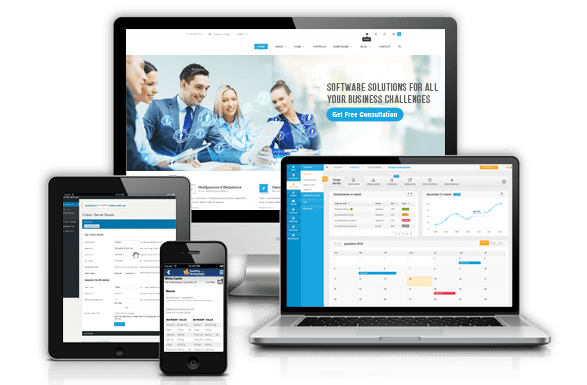 We build both commercial e-commerce websites designed to optimize customer satisfaction and drive sales, as well as internal web apps for aiding in business automation. Leveraging our partnerships with Magento and Shopify, we can develop and integrate digital storefronts, shopping carts, catalogs and payment solutions using their platforms. Consolidating disparate enterprise web applications helps organizations streamline workflows and simplify mission-critical processes. We provide custom API development and integration services for Service-Oriented Architectures (SOA) using REST and SOAP protocols to facilitate bi-directional JSON and XML communications.